(Phys.org)—A new study predicts that large-scale power plants based on thermoelectric effects, such as small temperature differences in ocean water, could generate electricity at a lower cost than photovoltaic power plants. 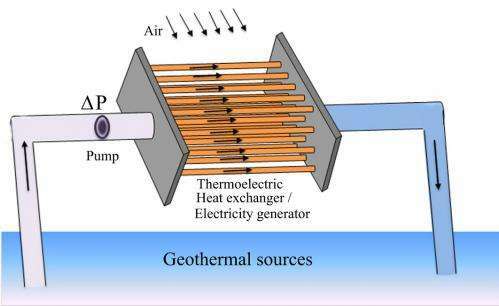 Liping Liu, Associate Professor at Rutgers University, envisions that thermoelectric power plants would look like giant barges sitting in the tropical ocean, where electricity is generated by heating cold, deep water with warm, shallow water heated by the sun. Liu has published a paper in the New Journal of Physics in which he analyzes the feasibility of such power plants. "This work is about the new idea of large-scale green power plants that make economic use of the largest accessible and sustainable energy reservoir on the earth," Liu told Phys.org, speaking of the oceans. This is because the sun heats the surface water to a temperature that, in tropical regions, is about 20 K higher than water 600 m deep. Essentially, the surface water acts as a giant storage tank of solar energy. 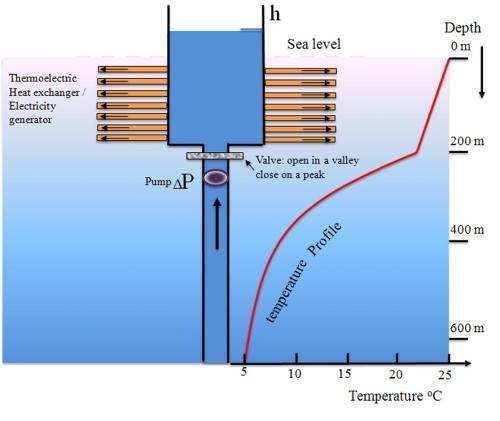 As Liu explains, thermoelectric power plants would work by harvesting the energy of ocean waves to pump cold water from a few hundred meters deep up through a long channel. As the cold water nears the surface, it enters a heat exchanger where it is heated by surface water on the outside. The heat exchanger acts as an electric generator, as its tubes are made of thermoelectric materials that can transfer heat through their walls and directly convert temperature differences into electricity. Large-scale, ocean-based thermoelectric power plants would have many advantages. For one, the "fuel" or temperature differences are free, unlimited, and easily accessible. Also, the plants do not take up space on land. Because they have no moving solid parts, they would have low maintenance costs. In addition, the power output does not depend on the time of day or season. And finally, the method is green, as it does not release emissions. Small-scale thermoelectric generators are already used commercially in applications such as microelectronics, automobiles, and power generation in remote areas. In these designs, the conversion efficiency is the most important factor because the fuel accounts for the largest portion of the cost. Most commercial devices have a conversion efficiency of around 5% to 10% of the ideal Carnot efficiency, with state-of-the-art devices achieving efficiencies of up to 20%. Although research is currently being done to further improve the efficiency, there are still limits to how high it can go. In the new paper, Liu shows that large-scale thermoelectric power plants wouldn't need to operate at extremely high efficiencies to be economically competitive; instead, the key would lie in engineering simple structures such as laminated composites in order to support mass production. These improvements focus on the conversion capacity, which, unlike efficiency, can be improved by orders of magnitude. In other words, because the fuel is free and in limitless supply, large-scale thermoelectric power plants could make up with their sheer size what they lack in efficiency. The cost of generating electricity varies by source. According to the US Department of Energy, the estimated cost per year of one megawatt of electricity in 2016 is about $0.83 million for conventional coal plants, compared to $1.84 million for photovoltaic power plants. Liu's analysis estimates that a thermoelectric power plant could generate electricity for less than $1.84 million, although an exact estimate is difficult at this stage. This estimate is for a thermoelectric generator that lasts for 20 years and uses ocean water with a 10 K temperature difference as fuel. If water from geothermal sources is used instead, the temperature difference could be 50 K or more, resulting in an even higher power gain and lower cost per watt. Overall, the analysis shows that thermoelectric power plants look very promising and could contribute to solving the world's energy problems. Liu plans to work toward this goal in future research. "We are currently working on experimentally validating the predicted power factor of the thermoelectric composites," Liu said. "Once this is validated, we will seek to fabricate a table-top prototype of the generator that uses ice water and hot water as 'fuel.'" Might as well go fund Rossi. How to you transmit the power you make? Hes already very well-funded with his first commercial plant in operation. For one, the "fuel" or temperature differences are free, unlimited, and easily accessible. Depends on how close to shore you can site this. With a steep descent direct link powerlines might be within reach. Further out you'd probably want to convert to some intermediary carrier (e.g. hydrogen) and pump that through pipes. Still further out you could store locally and occasionally send a tanker 'round to collect. I've always thought a great place for thermoelectrics would be the north pole. There is only a thin layer of ice between water at -2 and the ambient air which must be a lot colder most of the year. We could guess like aa or we could take a minute and look up power transmission solutions from engineers. "Provided that the temperature differential is fairly constant, OTEC should run on its own. The world's biggest Ocean Thermal Energy Conversion plant will be built off the coast of China by Lockheed Martin. The 10MW offshore plant will be built to power a new green resort and test the system as a whole. Data from this plant will be used to make adjustments for efficiency and power output, which will make future installations, up to 100MW, easier to design and implement. Lockheed Martin estimates that a 100MW OTEC plant could offset 1.3 million barrels of oil and cut carbon dioxide emissions by 500,000 tons." "Transmission solutions for connecting offshore power plants to the onshore grid"
This is a very old idea. We covered it in an oceanography class I took in 1979! Yes, my thought too. What about storms (part of this is on the surface), This would severely limit how far out to sea you can use this too. Are we going to string power cables halfway across the pacific basin? What about maintenance on a system like that? If you go to deep (and I'm talking a few hundred feet) you need specialized equipment to deal with it. With all the off shore wind etc, stuff like this is actually going to get real estate intensive even in the middle of the water, because you're going to want to do it near population centers that can handle the power being produced. I'm not saying it's not doable at all. I'm sure it's quite doable. I think it's worth pointing out the possible issues with it though. If they build it, it will be interesting to see how the upwelling water brings nutrients to the surface for life activity. What happened to the original OTEC? Are we going to string power cables halfway across the pacific basin? Since off shore wind likes shallow waters (due to the need to anchor the windfarms) and this system requires deep waters - the two aren't incompetition over the same realestate. I think it's worth pointing out the possible issues with it though. Cost vs. benefit will be the final deciding factor. The setup seems cheap enough, so it might actually be worth it. What I find most attractive about a system like this is that the promise of the article of "cheap cost" seems to actually fit. We've all heard about cheap solar and cheap wind. What's never talked about are the fantastically huge feed in tariffs and the fact that, at best, they're only producing 30% of the time...in effect making even the best current cost estimates off by a factor of 100%. THIS on the other hand seems very straightforward, easy to produce, no rare earths, low maintenance (assuming several things) AND most importantly highly reliable and dispatchable...IOW something that has a chance of actually working. I guess we'll just wait and see. This might be promising as a propulsion system for large vessels. It would elliminate difficulties of transmitting power to shore. AA still prefers to ad lib as if a few moments of idle musing can match in-depth studies from experts and engineers which they ought to know must exist. You didnt read the link. READ the LINK. Youll see cables stretching across the north sea. What I find most baffling is that it just doesnt occur to some people that, with subjects like this, OF COURSE real engineers would have written papers and designed systems, and that this would OBVIOUSLY be available on the internet. But they risk looking silly by guessing. Makes no sense unless you consider hubris or just lazy. The thermoelectric effect has been well known for at least 100-years. Despite a great deal of work the efficiency hasn't been improved much. The highest efficiency material tend to be very expensive and depend on rare-earth materials. It is well known that low temperature gradients tend to result in poor thermodynamic efficiency. The scheme would involve moving massive quantities of saltwater long vertical distances. The analysis apparently doesn't take the cost of the power transmission cables into account either. In general it seems to be more based on speculation rather than proven hardware. It is typical for engineers to not figure in the biological disruptive cost of their proposed schemes. But to someone who believes the AGW hysteria, this should be anathema. Think of all the low-lying countries that will be submerged! This would actually reduce the time, measured in centuries, for deep water to get heated. Not significantly, but still. I don't know anything about how the cold water at the bottom is replenished. My knee jerk reaction is that it gets replenished through the freeze/thaw cycles at the poles, but that's a wild guess on my part. I wonder how much cold water area is affected by one of these plants? Would cold water necessarily flow into the area to replace the amount pumped out? I know the top layer of water would cool, but the newly heated water that was brought up from below is warmer and has to go somewhere. Where does it go? Could it possibly stay local to the plant such that a circulation is formed locally between the surface water and the water at depth that would work to equalize temperatures locally and reduce the power output? I'm asking because I don't know. I would hope that the replenishment cold water would come from the surrounding area which would in turn ultimately get replenished by the freeze/thaw cycles at the poles, but I don't know enough about it. Algae growing on thermoelectric heat exchanger may lower efficiency quite soon. They propably have proposed a solution for that in their paper, tho. Why run the pipes so far down, when all you have to do is run wires to the junctions and provide a little assist to the convection currents set up there?? Don't you find it interesting that people are complaining about global warming and to fight it they suggest a manner in which to cause absolutely MASSIVE environmental damage? As many have pointed out - the concept is well known and well within the state-of-the-art as it exists today. But it will never happen because the greenies will have seizures over thermal pollution. If they become very common and are used on a very large scale they might cool the atmosphere by pumping up cold water from the bottom of the ocean to the surface. It will cool the topics and the trade w9inds might get cooler and make it rain more. Just me, but wouldn't doing this solar be more effective? And much less effective than solar? I don't mind if this technology gets developed. The more competing methods we have of producing clean power, the better. But ocean kinetic looks to my untutored eye to be a better candidate technology for investment, if we can solve materials and design difficulties. I do hope to see more engineering ingenuity going into tapping it than is currently happening. There have been OTEC efforts for about a century. They have all failed. The cause was either structural failure, large components overstressed by wave action, or heat transfer failure, because of bio fouling of the heat exchangers. Afaik, the latest such effort, off Hawaii, has now transmogrified into a designer water producer, peddling 'hyper-pure' deep ocean water desalinated for the Japanese market. They gave up on power production. The deeper cables are, the less trouble they are. 1 cm diameter fibre optic cables in 20,000 feet of water and 15 cm diameter cables plus buried 6 feet deep to keep from being damaged by draggers- depth isn't the problem. At best windmills are only producing power 30% of the time. I think that is an average, not a top amount. I know for a fact that some operate more than 30% of the time. I like the idea of using cold air (Arctic/winter) and the warm(er) water of the ocean. You can't cheat physics that way. The total energy extractable is still m*g*h. And the total power is dependent on how much mass you can feed into the system per second. Having many turbines does not give you an advantage (it's only a disadvantage due to much higher maintenance). .
wave commercial electric generation power is dead and needs to stay dead as it was the day it arrived. engineering scale size systems floating in the ocean is hard enough for pumping out highly dense energy resoivoirs of oil. the sheer amount of physical water that would need to be pumped per useable output btu of heat difference/gradient to drive the output on a thermoelectric stack is hard to just ignore. No, I think pretense and laziness are intrinsically offensive. Don't you? AA would be offended if I pretended to know something about software engineering. And yet he seems to think his phd gives him special insight into unrelated disciplines. This behavior is sadly pervasive among overeducated people. It hinders the free dissemination of knowledge. I'll continue to expose this sort of nonsense because it is important and also satisfying. We have a clean inexhaustible source of heat energy below our feet. Why isn't anyone smart enough to realize we can reach it? If we can go 100's of thousands of miles up to the moon we can figure out how to go down a few miles. Ok.. so put lipstick on OTEC (ocean thermal energy conversion) and call it something new? Didn't they do an OTEC demo in Hawaii 20 years ago? # Running turbine does not decrease the power of running water. Quantity of discharge of water is not altered even after running turbine. So far you have water running, the force involved "G" is constant so, no matter how much water you make fall. Thus power of running water at a given point remains constant. I am not, you are cheating Physics. "the estimated cost per year of one megawatt of electricity in 2016 is about $0.83 million for conventional coal plants, compared to $1.84 million for photovoltaic power plants"
Is this overnight costs or installed costs? $83,000,000/MW of coal and $1,840,000,000/MW of solar? $0.83/watt and $1.84/watt. $1.84/watt installed is about right for utility scale solar in the US. It was $1.81/watt at the end of Q2, 2014. Should be a bit lower now and will almost certainly be lower in 2016. The DOE database states from $1.92/watt to $8.42/watt for overnight coal. Median $3/watt. Roughly double that for installed coal (lots of accumulated interest during construction). Their coal price makes no sense to me. That is ONLY from Sol to Earth, U miss SO MUCH ! WHY Water_Prophet do U REFUSE to look at absorption/re-radiation of Earth to Space ? You seem to have a very serious reading/comprehension neglect bias problem ! 1. Your TSI graph ONLY shows Sol to Earth - largely Shortwave (SW) ? 2. Earth converts SW to Longwave radiation (LW) ? 3. Negligible SW is emitted to space ? SIMPLE logic by way of SUBTRACTION re energy PROVES LW to space is CORE issue ! Water_Prophet, these is a VERY simple issue, WHY do U ignore it & look intellectually feeble ? Running turbine does not decrease the power of running water. Quantity of discharge of water is not altered even after running turbine. So far you have water running, the force involved "G" is constant so, no matter how much water you make fall. Thus power of running water at a given point remains constant. I am not, you are cheating Physics. Conservation of energy. The water gives up its energy to the generator. Stacking generators along the height of the water column doesn't increase the energy output because the load attached to the generator creates resistance to the turbine's rotation which, in turn, creates a pressure drop across the turbine. The sum of the individual turbine pressure drops can't exceed the maximum available water pressure which is Height X Density X G. At most, the sum of the pressure drops across the turbines can only equal the max available pressure and that's only if the pressure drops across the interconnecting tubes are negligible. One would think that barnacles and algae would be be a huge problem in something that has a huge surface area like this. Flow and heat transfer would soon be reduced. The sea is a harsh environment and structures placed there are very expensive to maintain. No. In Physics there is a proven relationship between power, torque & speed ie Power = Torque x Speed & it has been known for well over 150 years Eg Steam ! Look at the placement of turbines on hydro stations, they r almost all as close to the bottom as possible as the potential energy of the fall (mgh) becomes torque & the more often you can deliver that the faster turbine spins & those two multiplied gives you power ! Power, whether from Torque x Speed or Volts x Amps is the SAME, that's the very nice part of the precise definition of power and works well through Physics. # similarly you install another one without breaking continuity of the water column, I suppose you know the series system or method. stick with solar panels . how about that. ..similarly you install another one without breaking continuity of the water column, I suppose you know the series system or method. No. Learn irrefutable physics 1st. If anything came even CLOSE operationally as U claim U would have a perpetual motion machine, ie use first turbine as pump to add same mass of water to top, whilst using lower turbines to generate power - doh - doesn't happen - NOT possible in THIS universe ! TRY understand high school physics, converting potential energy to kinetic energy, rate of delivery is Power. As I already pointed out to you, the sum of the individual pressure drops across the series connected turbines can't exceed the maximum available water pressure at the bottom of the water column. The flow rate will be determined by the sum of the individual turbine flow resistances and the max pressure at the bottom of the water column. The system of turbines will fill with water and none of the turbines will spin until the pressure across a turbine exceeds the force required to drive its generator's load. As each turbine begins to move, the pressure drop across it will subtract from the pressure available to the next turbine in the series. At equilibrium the power output of each generator will be limited by smaller pressure drops in exactly the right proportion that the sum total output is the same as a single generator at the bottom. And yet he seems to think his phd gives him special insight into unrelated disciplines. Disciplines I have studied? Like electrical engineering (which has a pretty solid founding in math and physics...and not only the physics that is relevant to electricity is taught there). Yeah. Studying stuff to the point where one can actually apply it does give one a special insight that cannot be had via google. Similarly I have tried to get a bit of education in astrophysics, though not anywhere near some of the best posters here (yyz, axemaster Q-star, et. al) . In the end I voice an opinion which I try to support with facts. What's your excuse? This sounds like a great idea. I don't really get how the transfer process works but if we can extract the warm water on massive scales maybe we can circumvent ocean warming? At the same time generating electricity. the pressure drops across the interconnecting tubes are negligible. Yes, each section will get the same pressure effect and the sum of those pressures can't exceed the pressure at the bottom of the water column. If you have 10 identical turbines stacked for a total height of H, and take the density of water to be 1 gram/cubic centimeter, each turbine will have a pressure H*1*G/10 = H*G/10. A single turbine at the bottom of a water column of the same height H will have a pressure of H*G. You do the math. The force required to rotate the turbine works against gravity to support some of the weight of the water so that the water that exits the turbine doesn't have the full weight of the water above or inside the turbine bearing down on it. Therefore the water pressure at the turbine exit is lower than that at the entrance. In other words, there is a drop in pressure. Here's an idea for you. Try it out. You know: real physics. You don't need much. You can try it out while in the shower by holding one hand under the stream and then doing the same with two hands one above the other- letting the runoff from one hit the other one. Notice how the force you feel is the sum of the force you felt for one hand? If you're still not convinced you can rig up a real power producing setup probably in less time than it has taken you to post - with all-household items. The existing generation techniques ARE based on a flowing water column, you can't generate power from standing water, THERE MUST BE FLOW AND PRESSURE TO GENERATE POWER. The pressures developed at the bottom of a full water column are the same whether the water is flowing or standing. Ok. Think of it that way if you like. In the example in my previous post the change in height = H/10, the pressure drop is (H/10)*G = H*G/10. Change in height as you just stated, unless you want to argue with yourself. Yes, G is constant and the flow through all turbines is the same and the energy transmitted to each turbine is lost by the water and shows up in its pressure drop, which is related to the change in height of the water as you have realized unless you want to argue with yourself. As antialias_physorg has suggested, build a model yourself using tabletop parts and try it out. How will this effect warming ocean temperatures? If we are unnaturally heating the water, what are the global impacts? We often rely on the Gulf Stream system, which allows the weather to be less chaotic. any introduced heat could negatively impact this. That thought occurred to me also. In reality the amount of change that a system like this could produce is miniscule. IMO thermoelectric plants are economically infeasible as such, but they could be also utilized for extraction of heavy metal elements from marine water, like the gold and uranium. Interesting. Do you have any data to back that up? I'm not saying that as a challenge or to be pissy :) I'm honestly interested if you've seen anything to suggest it. It would seem (on the face of it) to be very economically viable. There would be few moving parts, it could be made of very inexpensive material, minimal regulatory hoops to jump through for the tin plated dictators of the energy sector, no rare earths (AFAICS)....seems pretty cheap to me. How will this effect warming ocean temperatures? Good question. at first I would guess: Not much. Since you're not introducing energy, but working on energy that is already there. The temperature balancing will happen whether you do it through a contraption like this or whether you just leave the ocean be. What does happen is that you coool down surface layers and warm up lower regions. This means lower regions will be somewhat less oxygen rich while surface layers will become oxygen richer (solubility of oxygen depends on temperature). One has to take into account that this would be VERY regional (the ocean is BIG). So the overall effect would probably be quite minute - even if this were to be adopted as the single, global source of energy (which we shouldn't. It should be part of a mix if it's economically viable). Do U understand distinction between a speed meter & a turbine designed for power ? 1.Meter (instrument) designed to interfere with flow as little as possible. 2.Turbine designed to extract as MUCH power as possible therefore interferes. Have you thought just WHY your idea hasn't EVER been implemented since hydropower was imagined well over a hundred years ago ? The economics have been worked through rather thoroughly for a long time & its just not worth it. If however, U used your own capital on your own estuary/beach and U were the ONLY one to maintain it & process electrodes or even buy your own ion exchange resin then you might enjoy it & maybe collect some heavy metals to gain some satisfaction of accomplishment but, for the amount of time spent alone, you would make far less money than flipping burgers at McDonalds. Even where there might be so called waste power (somewhat rare) the "net present cost" is far higher than income possible from selling any metal collected - methods either via ion exchange resins or electrolysis. In this respect, economies of scale make the relative effectiveness even worse ! Basic physics in terms of fundamentals re Power & Torque are KNOWN for hundreds of years, just because we have more advanced engineering in last 100 yrs doesn't defeat basic Physics. Meters are engineered ie Specifically Designed to interfere as little as possible with quantity being measured. Eg. Tachometer on a car engine, if the engine is in neutral & you rev it to 5000 rpm it ONLY shows engine speed, no power delivered. Can U see the distinction now re your experiment ? You have a link ? Agree fully with that pattern. People who graduated as a Physical Chemist (PC) of which Water_Prophet claims, should KNOW energy flows in 3D, so Y do U completely IGNORE Earth's emissions which any person with intelligence & Physics training easily determine it MUST be overwhelmingly Long Wave (LW) ie. Plain to "see" Short Wave (SW) from Earth is negligible ! Why do U ignore LW, where CO2's absorbance/re-radiation is the HIGHEST ? What does this even mean re U? How can you say I ignore longwave radiations? By evidence U ignored long wave (LW) radiation re CO2's interference to space, U only saw TSI. U write fossil fuel (FF) proportion of TSI, yet U IGNORE FACT Earth converts short wave (SW) to LW & CO2 interferes with emission to Space. Nobody is disagreeing FF adds heat & CO2. But, U, as a claimed Physical Chemist (PC) haven't acknowledged CO2's interference U even claimed "CO2 is a red herring", which is obviously completely WRONG ! Simple issue Water_Prophet I asked before, WHY do u STILL evade ?